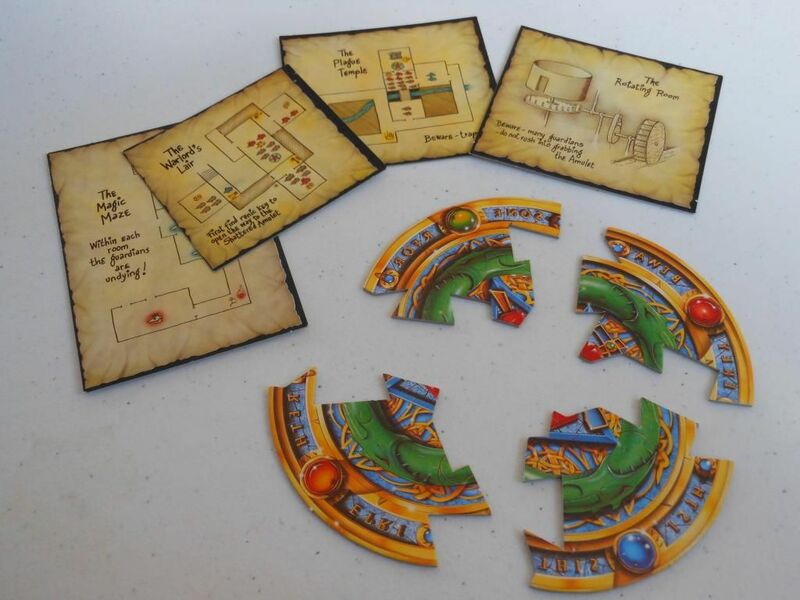 As boardgamers, we love rules. Rules tell us what we can do, and they set the parameters within which we must formulate our strategies. Rules constrain our actions, and in so doing, set us free to master new challenges. Rules allow us to outwit our opponents, manipulate allies, and develop our skills. They tell us how we can win, while sowing the seeds of our defeat. Without rules, we're all just playing make believe with our toys. But I have a rule that is resulting in me doing something unusual. The rule is simple: I don't keep board games in my collection that I don't play. I don't care what the game is. If it doesn't get played, it doesn't get shelf space. And that's why I'm getting rid of Advanced Heroquest. I originally got Advanced Heroquest when it first came out. 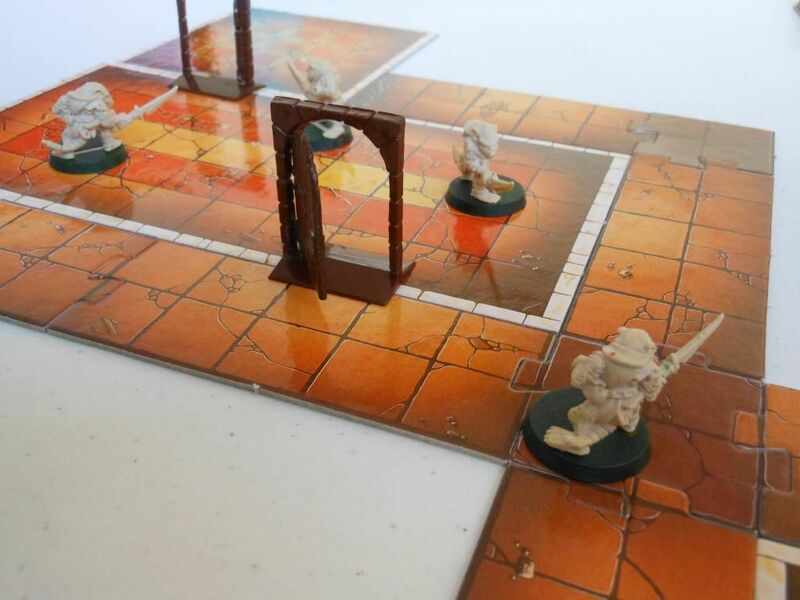 I had previously played (and loved) Heroquest, and I was expecting Advanced Heroquest to be very similar, but with new monsters and rules for modular boards. Of course, we all know that what I actually got was a completely different game. I think I was probably a bit too young to fully appreciate and enjoy the game. There were lots of rules and fiddly charts. There wasn't a book of nice scenarios like there was in Heroquest. Even creating characters was a bit laborious and convoluted. And then there was the sheer difficulty of surviving an adventure. In the end, I only played a few times, and I'm pretty sure every game ended with a total party kill. The game was, quite simply, brutal. So it got relegated to the cupboard. Years later, I went to university and sold all my games so I could buy beer instead. Later still, I realised how stupid I was to have sold all my games, and I didn't even have any beer to show for it. I started my collection from scratch, and began buying old games for ridiculously large amounts of money. 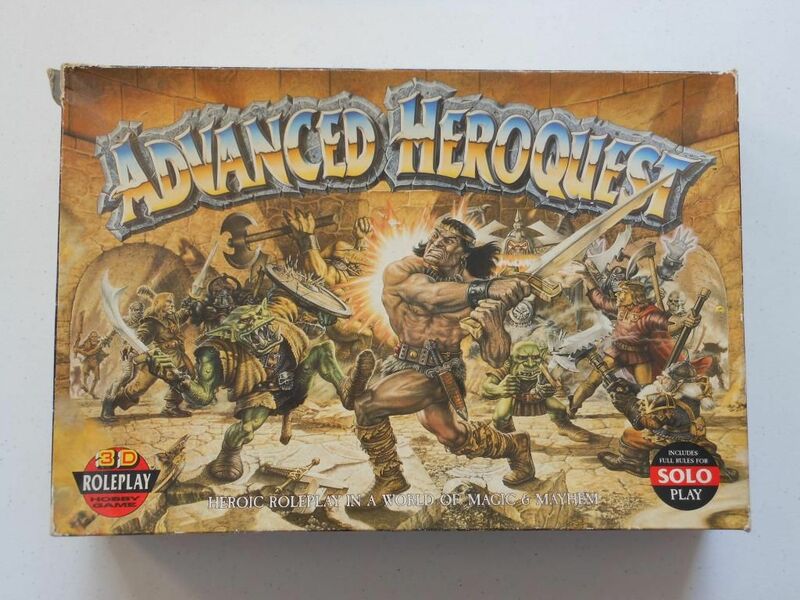 In the process, I acquired a copy of Advanced Heroquest. It was complete except for some miniatures, but a friend gifted me a copy of Mighty Warriors (which uses the same miniatures), and so I was good to go. 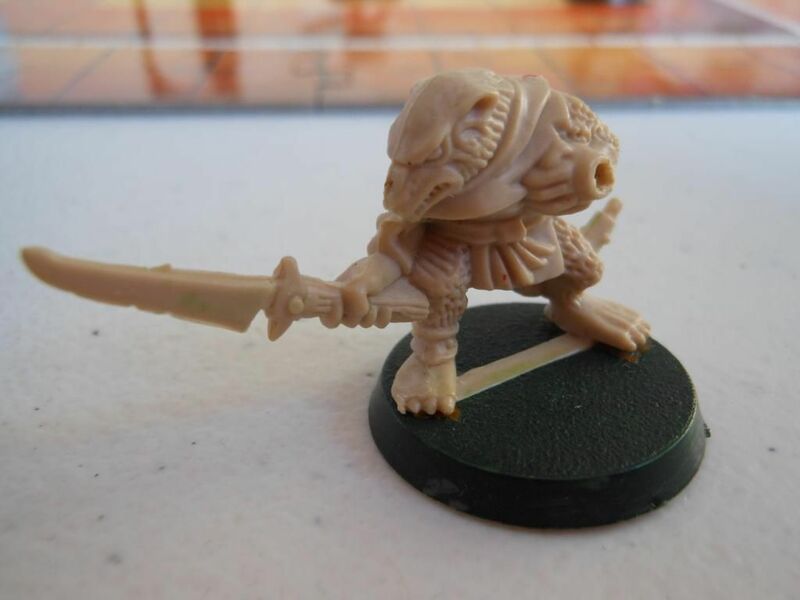 The Advanced Heroquest miniatures are excellent. I flicked through the rulebook. When I first played Advanced Heroquest, I was playing a lot of Warhammer. I think that was part of the reason the game seemed so strange to me. In Warhammer, skaven die in hordes. They are weak, cowardly critters that require massive numbers to win a fight. But in Advanced Heroquest, they are lethal. My poor heroes never stood a chance. Advanced Heroquest is an example of a game that just wants to beat you up and leave you in a ditch. When your heroes start out, they can hardly handle a single skaven, and the equipment you have at your disposal is pathetic, rusty junk. Your wizard can only cast spells if he has the ingredients to do so, and casting the spell uses those ingredients up. You can't toast skaven every turn with fireballs, you just haven't got the ingredients to do so (and you sure as hell haven't got the money to buy new ingredients). And once your ingredients are gone, your wizard is just a useless bag of human skin you have to lug around in the dark. And your elf? Yeah. Your elf has a bow. He also has a limited number of arrows. Use all your arrows, and that's it. And don't even think about stocking up on arrows before you start. You haven't got enough money. Ever. If you survive a whole dungeon, you come out the other side as battered, half-dead warriors with maybe just enough money to restock on all the ingredients and weapons you used. And then you can repeat the whole torturous process. While the difficulty of the game is a major problem, it is also one of the biggest selling points. There is no other game that creates the sense of dread that must surely come from delving into dark caves to fight monstrous beasts. 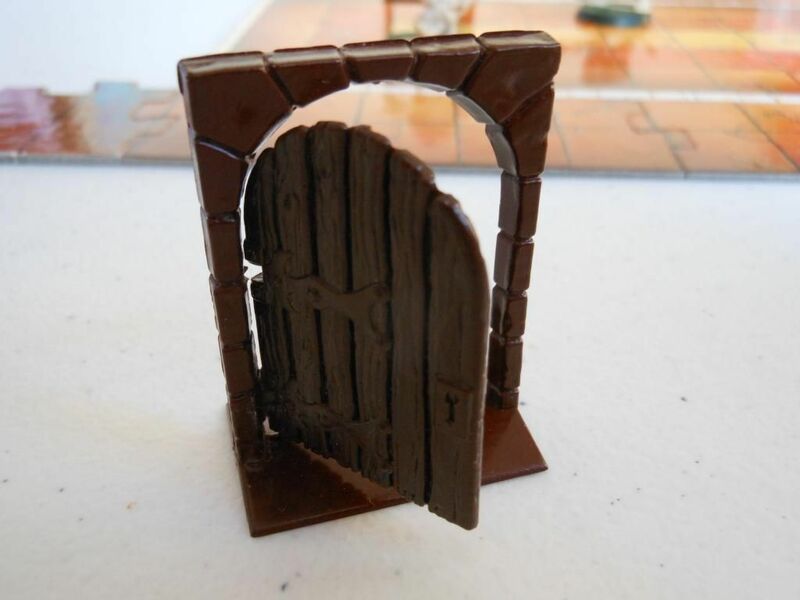 When you play Advanced Heroquest, you are genuinely afraid. You move cautiously, you pick your battles carefully, you pay henchmen to come with you because it's a bit frightening down in that dungeon on your own, and when you find a monster you know things are going to get ugly because there are no easy kills. It all feels very real. The threat is tangible. Totally immersing. Games Workshop have put a lot of effort into the Warhammer world, and most of the background information talks about how tough life is for everyone. The world is brutal, cruel, and full of villains. Advanced Heroquest is really the only game to accurately portray that background fluff. For the first time, you really get a sense that there are no easy choices, and every decision you make could be your last. Just look at the artwork in the rulebook (which is uniformly excellent). Most of the pictures capture the agonising final moments of adventurers who made a bad choice. Even the goblins in the rules look terrifying. The game is thematically strong, and really makes you care about your people. You care because you know you are about three dice rolls from death the whole time. You care because you are down to your last arrow, but you know the next room could be teeming with monsters. You care because you have the same rusty old sword you had three adventures ago, but if you open just one more chest you might get lucky and find a sword that is a tiny, tiny bit better. You care because this is serious business. This is not throwaway fantasy where you can stride through the tunnels like some kind of demigod. This is gritty and real. Unfortunately, this also makes the game a bit of a chore to play. I never really enjoyed the game when I was young, and I still don't now. I appreciate the design. I look at the rules and I think they do a really good job of turning a roleplaying game into a board game. There are good character creation rules, good ways to progress in skill, good items to acquire, things to do between missions... Oh, that's right. I never told you about between missions, did I? You see, if you manage to drag yourself back to town, you get to do all the mundane things that people do when they aren't cleaving the heads off orcs. Like paying rent, or securely storing your loot to protect it from thieves. It all adds up to create a world that feels real (dangerous, but real). Your actions are important, your decisions matter, and you will develop a character you care about. And that is why it is such a punch in the gut when your beloved character dies in the first room of a dungeon in a fight against skaven. This game is a triumph in so many ways. It is the only dungeon crawler I have played that adequately gives you that sense of panic, of being trapped under the ground and surrounded by enemies. It also provided rules for solo play, which was pretty unusual for the time. But the game fails for the reasons it succeeds. Mission items for the only scenario included in the box. When I play Warhammer Quest, I can laugh when I get a cave in that kills the whole team in the first room. It's funny. But when I see my heroes getting drubbed in Advanced Heroquest it's like losing good friends. It doesn't feel fun. And that, pretty much, sums it up. I don't have fun playing Advanced Heroquest. 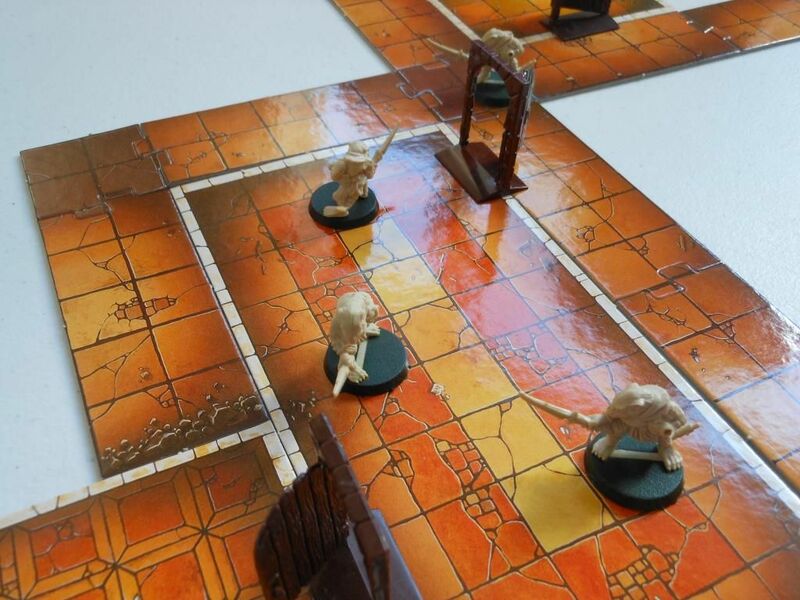 If I want to play a dungeon crawler that is a bit of silly fun I will play Legend of Zagor, Dungeons and Dragons the Adventure Board Game, or Dragon Strike (all of which I really enjoy). If I want to play a dungeon crawler in the Warhammer setting, I will play Warhammer Quest. There is simply no space for Advanced Heroquest. And I don't keep games I don't play. No matter how good they are. 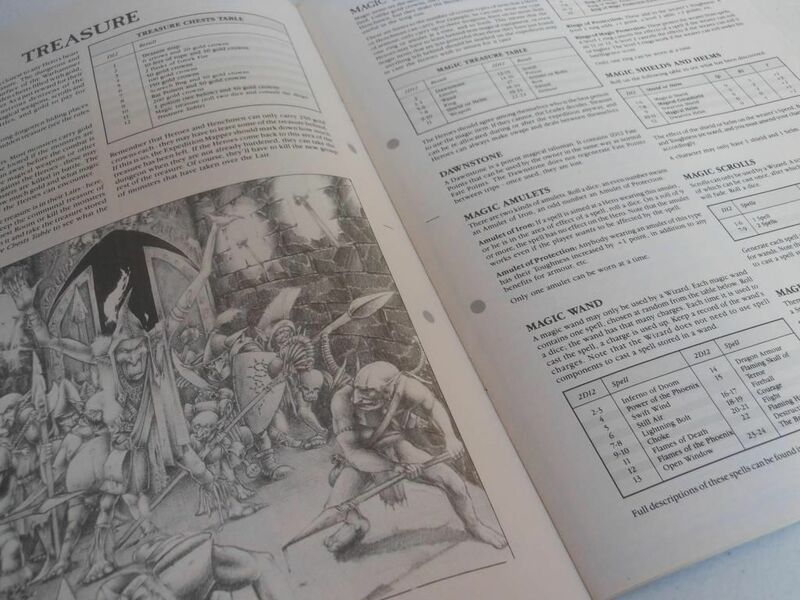 I found your Heroquest article through a web search and I thought you might be interested in taking a look at and sharing the HeroQuest project I am currently working on. I think you may enjoy it. Let me know what you think. Your stop motion video is wonderful. Great work. Thanks for reading. I've been away from the blog for a little while, but I'm back in action now with new content incoming this week. Hope you enjoy looking around!